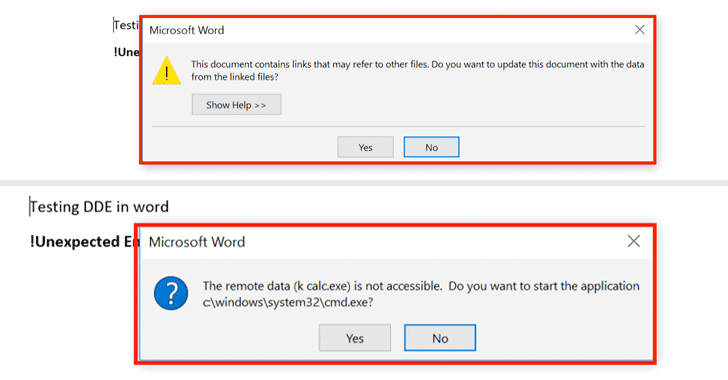 Security researchers at Cisco's Talos threat research group have discovered one such attack campaign spreading malware-equipped Microsoft Word documents that perform code execution on the targeted device without requiring Macros enabled or memory corruption. Thousands of applications use the DDE protocol, including Microsoft's Excel, MS Word, Quattro Pro, and Visual Basic. The exploitation technique that the researchers described displays no "security" warnings to victims, except asking them if they want to execute the application specified in the command—however, this popup alert could also be eliminated "with proper syntax modification," the researchers say. As described by Cisco researchers, this technique was found actively being exploited in the wild by hackers to target several organisations using spear phishing emails, which were spoofed to make them look as if they're sent by the Securities and Exchange Commission (SEC) and convince users into opening them. "The emails themselves contained a malicious attachment [MS Word] that when opened would initiate a sophisticated multi-stage infection process leading to infection with DNSMessenger malware," reads a blog post published by Talos researchers. If allowed, the malicious document will communicate to the attacker hosted content in order to retrieve code that'll be executed to initiate the DNSMessenger malware infection. "Interestingly, the DDEAUTO field used by this malicious document retrieved code that the attacker had initially hosted on a Louisiana state government website, which was seemingly compromised and used for this purpose," the researchers say. What's more worrying? 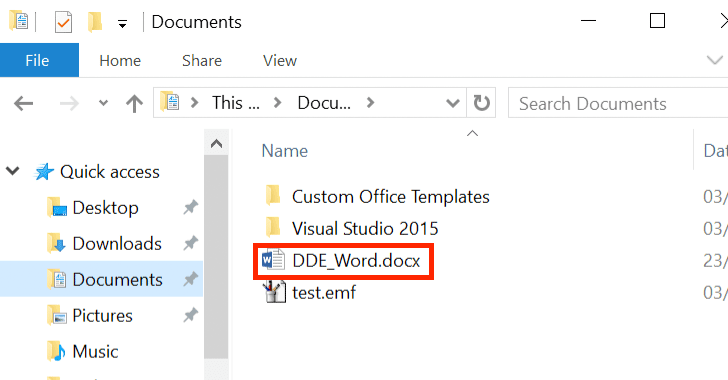 Microsoft doesn't consider this as a security issue, rather according to the company the DDE protocol is a feature that can not be removed but could be improved with better warning alerts for users in future. Although there's no direct way to disable DDE code execution, users can proactively monitor system event logs to check possible exploitation.